Managing International Transactions for Corporate Clients! Fourth Chicago Based IPO to over a Billion in Valuation! Are Startup and Tech Deals Coming back to Chicago? Following in the success of LinkedIn, Groupon, Envestment’s IPOs, the Chicago startup, GrubHub went public on April 4, 2014, with shares soaring to over $40 dollars a share well above their $26 dollars per share Initial Public Offering (“IPO”) price. The New Company was formed through a merger between Chicago based “GrubHub” and New York based “Seamless.” Will the surge in IPO’s for tech companies continue? Is there real value there for investors? Many experts expect the shares to do fairly well, as the initial expected offering rose from the range of $20-$22 per share, all the way up to $26 per share late Thursday night before the Friday morning offering. The IPO is great for GrubHub, but more importantly, the Chicago Startup community at large. Chicago is beginning to build a reputation in recent years for its successful tech companies with even better IPOs. GrubHub is the third recent, Chicago based Tech Company, to have an IPO valuation of over a billion dollars, nearly, $3 billion. Groupon, the digital coupon and bargains merchant went public in 2011, and is currently, valued at $5.4 billion dollars. While, a lesser known IPO for Envestnet, a local tech startup that produces software for financial advisors has led to a current valuation of $1.35 billion dollars. All this success helps aids in Chicago’s current effort to rebrand the City as a Startup and Entrepreneurship HUB. An effort shared by President Obama, who awarded Chicago, a coveted federally funded high tech hub on February 25th of this year. Hopefully, this will continue to keep Chicago on the map as not only, a distribution network for products and commodities, but also a thriving City for innovation. Does this mean more deal and intellectual property work for lawyers? Certainly, seems so as Entrepreneurs are starting to find success and providing a return on investment to Angels, VCs, Private Investors and public shareholders! The City of Chicago received a total of $70 million for a Pentagon-led institute that focused on high-tech digital manufacturing and design. The Startup Community in Chicago is flourishing, and there’s no better place or time for individuals with a dream and an idea, to start looking to make them into a real business. 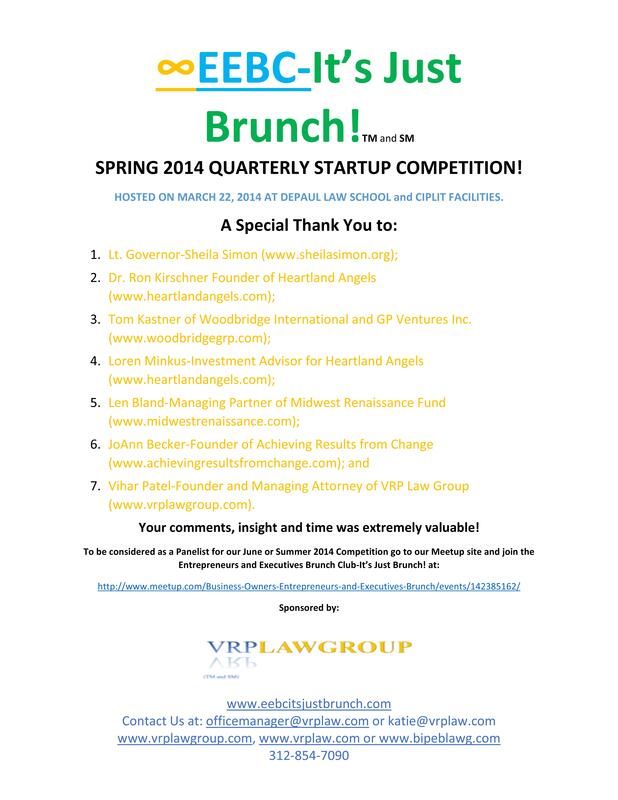 If you or someone you know has an amazing idea for a startup business and is looking for investors, look no further than the Entrepreneurs and Executives Bruch Club’s Startup Competition (EEBC-It’s Just Brunch!). 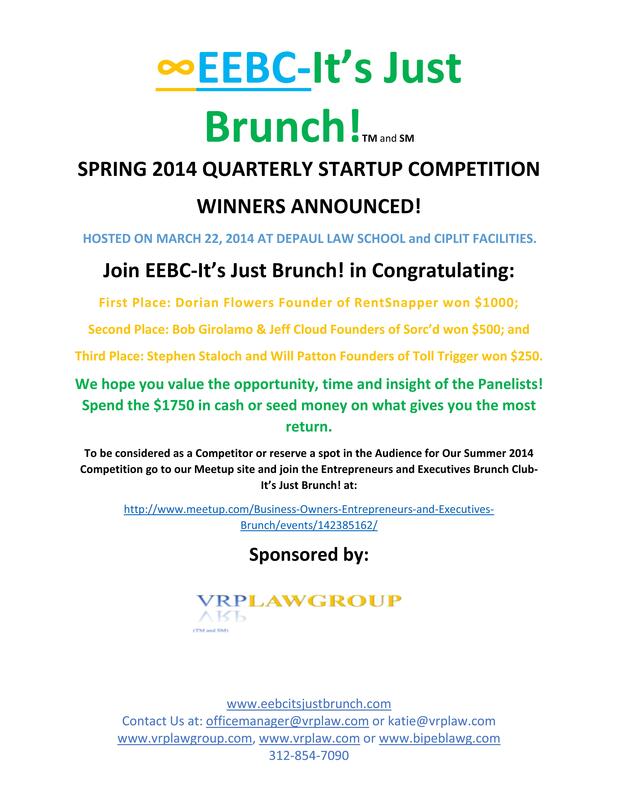 The next EEBC Quarterly Competition takes place in June 2014 and the EEBC is currently, looking for qualified teams to compete. The New Generic Top Level Domains (GTLDs) and what do they mean for online consumers and retailers! When we browse the internet, we know how to get to the websites we want to go to. We know to type in, for example, “amazon.com,” and know that by doing so we will be able to shop on Amazon. This has already started to change, however, as the Internet Corporation for Assigned Names and Numbers (ICANN) has decided to make over 1,400 new top level domain names available for purchase. Now, we will likely have to go to “movies.amazon” or “books.kindle” in order to get to the site we want. In essence , we will have to relearn how to find products and services on the web., Moreover, consumers will have to understand the new top level domain and which TLD and URL will enable them to find the products or services they want. On line retailers will have to understand how the new TLDs may impact their SEO process. consequently, the new TLDs may or may not lead to a better online distribution means. These new domain names have been met with mixed reviews. On one hand, companies are excited; these new names allow them to advertise their brands even more, encourage competition and innovation, and assist consumers in getting to the correct site. On the other hand, however, people worry about the cost of registration and upkeep, not to mention the potential for trademark violations and cybersquatting. Registration for one name costs $185,000.00, and in most cases, it makes sense for companies to register multiple names. This is a defensive maneuver, as it will keep others from registering names that will cause consumer confusion or infringe on trademarks. While ICANN has developed a database to protect trademarks, called “Trademark Clearinghouse,” it has its drawbacks. For one, it costs $150.00 a year, per trademark. Further, it may not be the most effective; it only protects against identical matches of trademarks. This does not include misspellings or names that are very similar to trademarks. So, companies will have their work cut out for them when purchasing the top level domain names and protecting them from competitors. Understanding the Naked Licensing Doctrine and Its Impact on Advertising, Business, Licensing, Marketing and IP Protection Strategies! The Naked License Doctrine is often overlooked by many business owners, corporations, franchisers, advertising, marketing and licensing professionals. For example, there are often times when there is no oversight over how your brand, design, logo, business name or trademark is used by different departments, suppliers, vendors, and other third parties. Many times, it is an employee using your brand, design, logo, business name or trademark to assist non for profits or promote events for others; however, there is no license of your mark or how the mark is used by the non for profit. Other times, the advertising and marketing department rolls out a new version of your mark, but does not acquire approval to make the modifications or recognize how it might affect the commercial impression of your original mark. Sometimes, there is a negative response from consumers and it may actually lead to a dilution or tarnishment of the original mark. In other cases, the advertising and marketing professionals are too eager to acquire other distribution channels by encouraging use of the mark on a third party’s website, store fronts, advertising and/or marketing brochures without having the third party sign any agreement or license to use your mark. The worst cases are when franchisers do not take the time to see how their franchisees are using the brand or mark. This is a significant problem even if, the franchise agreement has some provisions relating to licensing and use of your brand or mark. The key is are there any actual methods or means for a brand or trademarks owner to prevent a third party or licensee from changing the colors, design, layout, location, font or quality of the products or services sold under its brand or mark. Is there some process to have a third party or licensee submit its modification to the original brand or mark owner? Is this process actually utilized? Is there any means of monitoring or overseeing the third party or licensee’s activities to determine if, your brand or mark is being misused? If there is no practical means to ensure that your brand or mark is not used, in any way that dilutes, tarnishes or changes the commercial impression of your original brand or mark, then you may be subject to losing your trademark rights. Even if, you have a license, this situation is ripe with others being able to assert that the license is in essence a naked licensee, thus, you should not be allowed to retain trademark protection of your brand or original mark. It is always a good idea to consult a trademark attorney prior to licensing and instituting trademark policing policies.